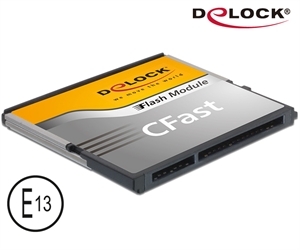 This Delock CFast Flash Card supports the CFast 2.0 standard and allows even higher data transfer rates than memory cards of the previous CFast generation. It is therefore ideally suited not only for professional usage in photography, but also for all other applications that require fast read and write speeds. CFast 2.0 memory cards use the SATA 6 Gb/s protocol and convince with lower power consumption.